Are you looking for ways to be successful in your part time job? A drive to succeed is not just reserved for those people in full time careers. People work part time for many different reasons and you can still succeed in your job, taking it in the best direction for you by working flexible, temporary and part time hours. Whatever type of role you are working in for your part time job, some of you may feel that you are not treated by your colleagues in the same way as they interact with their full time colleagues. So, how do you succeed in the workplace and gain the respect of bosses and colleagues alike? Being successful in your part time job can come from developing good habits in the workplace. Habits that demonstrate you are as capable, committed and professional as your colleagues. But the good news about adopting good working habits in the workplace is that they also have a positive effect on you, too. They can boost your self-esteem, your confidence and increase your productivity. This means you will be getting much more satisfaction from your part time job than you might do otherwise. So, what are the good working habits that can do this for you? Let’s take a look at some tips below. What Are The Good Working Habits For Success In Your Part Time Job? Are you prone to procrastination? Lots of us are. If you procrastinate too often, it can get you into trouble with superiors and you can also lose the respect of your colleagues. Get into good workplace habits and remove those distractions – the ones that cause you to drift away from the task in hand. Close any social media tabs that you have open and leave them closed until break times. We all love to scroll through news feeds aimlessly but work time is not the right time to be doing this. If you are prone to procrastination – looking at social media, wandering around the office for no reason, gazing out of the window at the streets below – try to identify the reasons for it and address them so that you can remain on task and be more productive. Here are some tips on how to overcome procrastination. Increasing your productivity in the workplace is not about working lots of hours. In your part time job, depending on your role, you might be asked to work extra hours, occasionally. This is fine. You might be covering for a colleague or helping out at a particularly busy time. However, a good workplace habit to develop is about being clear on your hours of work. Today’s technology means we can be in touch with people 24 hours a day. This does not mean you are on call for work, 24 hours a day. When you have finished your hours, that is your off time. Acknowledging your off time will ensure you stay fresh and don’t become fatigued from trying to juggle too much work time with your out-of-work time. A fatigued you can mean a grumpy you and an unproductive you. Not a good workplace habit. Dividing your time carefully and giving yourself off time is a good habit because when you are actually in work, you will be more alert and this, in turn, can make you more productive and full of ideas. A great way to boost your success in your part time job. What has keeping yourself fit got to do with your part time job? Well, depending on the type of part time job you are doing, it can certainly help you physically. Your role might require a lot of walking, lifting heavy objects, climbing or working outdoors. Keeping yourself fit can assist with your future success in cases like this. But what about other types of jobs? If you are sat at a desk for a few hours each day, why is it important to keep yourself fit? When you keep yourself fit, you feel good about other areas of your life. You will have more confidence and more energy and this can be transferred into the workplace for your part time job. Rather than feeling lethargic from sitting at your desk all day, you will be more productive and full of new ideas. This can aid success in your part time job. Having excellent time management skills is key to being successful in your career and is perhaps more important when you are working part time as you have less hours in your work day to play with. Make use of company software that is employed for adding tasks and marking them as complete. Use your own systems, too, that you are comfortable with. It can be something as simple as a notebook and pen for jotting down daily tasks. If you give someone a time-frame for task completion make sure you complete on time and learn which tasks need to be prioritised over others. And then, of course, there is punctuality. Don’t be late for meetings. Don’t be late to start your shift. Give yourself plenty of time to get to work if traffic, train schedules or bus routes don’t quite fit. If you have more than one part time job, arranging your routes between jobs is key. Your excellent organisational skills will really help with achieving success in your part time job. Apart from organising your time – as is mentioned above – be organised in your work space, too.Keeping your work area clean and tidy will not only help your productivity and improve your mood, it will also impress team leaders or management. An organised workspace can also help your colleagues, too. If you do job share, for example, leaving your space clean and organised for your job share partner will mean they appreciate you more. Taking your part time job as seriously as you would a full time job will help push you towards success. And if you want to gain the respect of your colleagues and superiors – and any members of the public your job requires you to deal with – looking the part is important. Depending on your part time job, dress smartly and be well groomed, taking care of your personal hygiene, too. If your work requires you to wear a uniform, make sure it looks crisp and clean. If you look the part, you will feel the part and this will help your performance at work. A good work habit for success in your part time job is to be a good team player. Don’t try to take on too much on your own. Being part of the team gets tasks completed and earns the respect of your colleagues and seniors. Being a team player is all about communication, too. You can communicate your ideas but also have good listening skills and take other people’s ideas on board too. Nobody wants to work with a know-it-all who refuses to listen to other people’s ideas. Are you someone who waits to be told what needs to be done all the time? Working under your own initiative is not about taking off and trying to to do everything on your own. Sometimes, in your part time job, situations may arise where you need to make a decision quickly and act on it for the good of the company. Acting on situations like this can help your future success in your role and show your superiors that you can think for yourself, you take your role for the company seriously and could be considered for promotion or future development. And, in being helpful, also don’t be afraid to ask for help yourself when you need it. 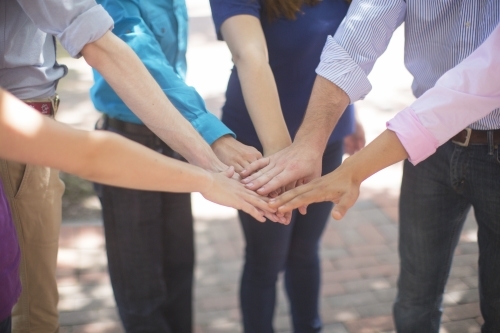 These are good workplace habits because it can build team morale. If you spot someone who might need help, it might just a helping hand you give them with a one off task or you could be their mentor. Also, in asking for help from others, this shows your human side. If you feel you need more training with a particular aspect of your part time job, your boss might well appreciate you mentioning this. It can help them to identify where more staff development is necessary. You get to build on your career success by developing your skills and your boss gets a more productive and knowledgeable staff by offering relevant training. Sometimes, situations might arise in the workplace where your help would be appreciated in a department or area that is not necessarily your job. Pitching in and doing your bit can help with success in your part time job. A reply of ‘it’s not my job’ when it is suggested your help would be appreciated is not going to help your bid for success. People work part time for lots of different reasons and you might not be in a position where you can attend work social events on a regular basis. Where possible, if you can attend any get togethers or work fitness clubs, for example, this can be a great way to get to know colleagues and superiors on a different wavelength. It can also boost your performance at work because you might be able to work more closely as a team. These are just a few habits that you could develop in the workplace that will help you to be successful in your part time job. There are lots of other habits that you could adopt – perhaps you already have a few in place that are paying dividends for you in your career development. Search for part time jobs in the UK and carry these habits with you into your new job and you could soon be enjoying career success.